Deep in the forests of British Columbia, you’ll find this fairytale-like tree house climbing high into the canopy. 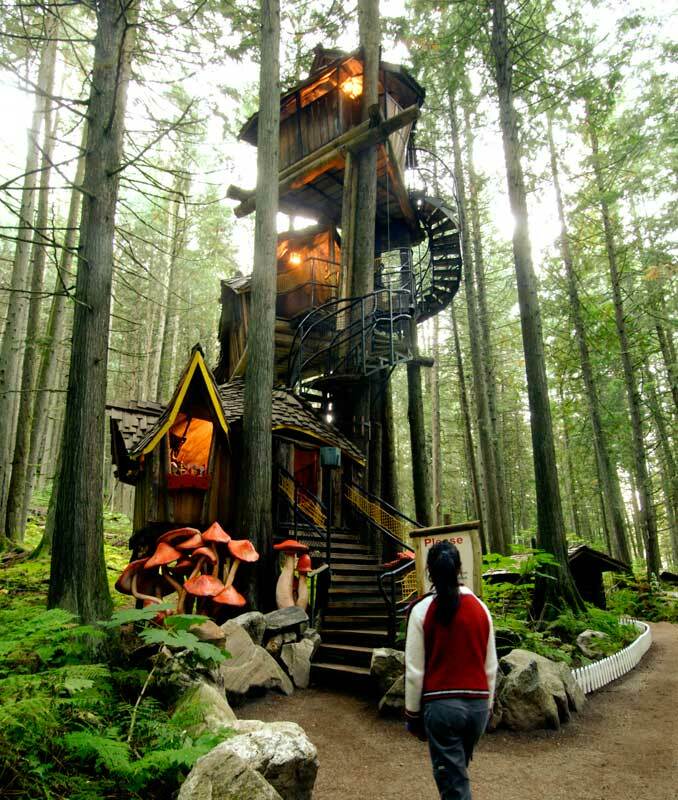 Standing at around 47 feet, it’s the largest tree house in all of British Colombia, and possibly even in all of Canada. It’s a magnificent creation that serves as the centerpiece for the fairytale theme park, Enchanted Forest. Now here’s one that’s sure to turn some heads. 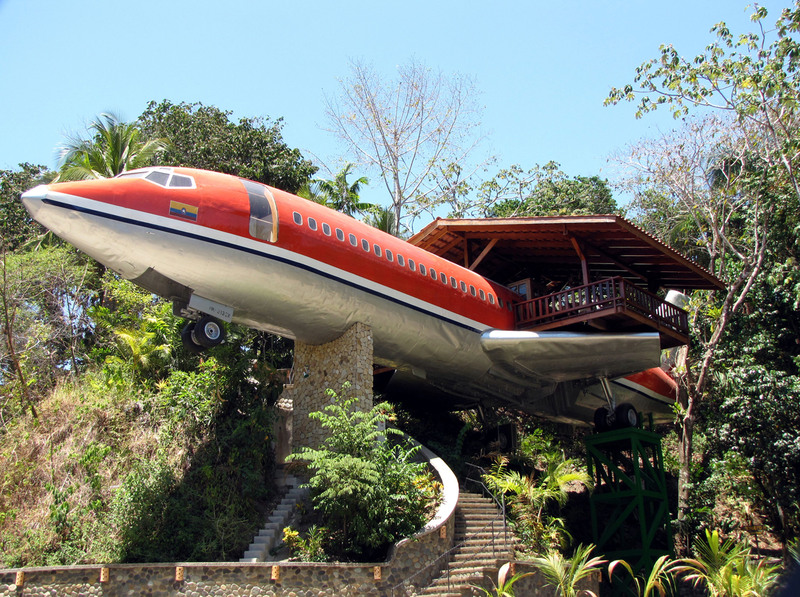 A tree house hotel made from a full-sized, refurbished 727 fuselage. This high-flying spectacle soars over a lively Costa Rican forest and provides spectacular views of the surrounding wildlife. Inside, you’ll find a two-bedroom suite complete with hand-carved, teak furniture, a full-sized private bath and access to a terrace where you can unwind and take in the beauty of your surroundings. Good luck finding this futuristic tree house creation nestled deep in the Norwegian backwoods. Like something out of science fiction, this tree house blends in seamlessly with the surrounding environment and disappears before your very eyes. It’s a chic 4x4x4 structure with mirror walls that reflect the stunning views surrounding it. And what’s best about this tree house is that it’s just one of many contemporary lodgings that you can rent out in the area. Who knew that the most peaceful place on earth actually sits just a few feet above the earth? Well, it’s not an official title, but judging by the description of this teahouse tree house in Japan, we firmly believe that it would be nearly impossible to not find some inner peace here. Built by famed Japanese architect, Terunobu Fujimori, the Tetsu Teahouse was designed specifically for relaxation and enjoying the full beauty of the blooming cherry blossoms that surround it. If living 50 feet up in a tree isn’t thrilling enough, the builders of this Ecuadorian tree house went ahead and added a swing for you. Did we mention that it swings out over a nearby cliff 2,660 meters above sea level? If you can muster up the courage to give it a go, the panoramic views of the vast Ecuadorian forests will surely ease your fear of the death-defying stunt. This one definitely takes the cake for the largest tree house around. Built by a minister who experienced a vision from God, this behemoth stands at roughly 90ft tall and houses nearly 80 rooms, a church, and a working bell tower. Although it has been closed indefinitely by the local fire marshal, there’s still a cult following that’s working to see its wooden doors reopen one day. This isn’t your average backyard summer project, but it does go to show what you can achieve with a little bit of determination and a lot of spare wood. Feel inspired yet? Go ahead and give it a shot. Building a backyard tree house is a great summertime activity for both kids and adults. Although the ones we just saw aren’t your average DIY project, that shouldn’t stop you from dreaming big and putting some heart into it.